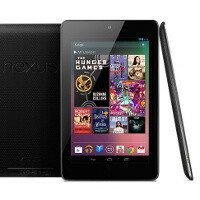 Now this could very well be an elaborate hoax which we can't imagine one would go through the trouble to make just for regurgitating some specs we've already heard about numerous times, but an alleged live chat with an Asus rep has revealed the laundry list of technicals for the upcoming second edition of the Google Nexus 7 tablet. Granted, the rep places Q2 end in the month of July, but it's not the first less than knowledgeable rep, nor will this be the last. More fun is the fact that he gave out the full list of specs with the warning that this is still not public, yet they'll send it out for review anyway. Either the announcement is imminent, or the rep doesn't really care, or maybe both. As you can see below, the 7" 1980x1200 pixels screen has been confirmed, along with a Snapdragon 600 processor, 5 MP rear camera, 4000 mAh battery, and optional 4G connectivity. Yes, and the price will be $350$, because a larger battery means more difficult to make it slim, ok? People are never satisfied, want everything good but a low price. If you want, you can buy an external portable battery. I know, I am willing to pay $700 for a 4.7"-5" phone to have 4000mAh-6000mAh battery :D I really don't mind if the phone is thicker. In the end of the day, end user experience goes a long way for me. Ha. 'Decent' you say? For $200? People seriously have a screwed up sense of value these days... unless something is subsidized 50% nothing will ever be a good enough value. I hope it wont come with lag like the 1st gen.
Really? I used the One X for a year and its performance on Jellybean was outstanding, faster than S3s with their "more powerful" Exynos Quad. I did side by side comparisons and the "Tegcrap 3" was faster opening apps and in general UI tasks.. Yes it struggles on games and needs aggressive governors and custom kernels to unleash it, but outside of the gaming zone it isn't that bad as you make it out to be. Of course the Mediatek chip will have better performance as the PowerVR 544 is better than Tegra 3's GPU and is a newer chipset. Do you remember Tegra 3 came out in 2011? But still Qualcomm is ahead of Nvidia by a long shot now, loving the performance of the Adreno 320 on my HTC One. Tegra 3 is good enough, it's Asus i/o, should do some research. Asus memory is terrible, its a known fact on the Transformer Prime etc. When you are downloading or transferring file, it lags like crap. Nothing to do with Tegra 3, it performs just as well as other Quad Core A9's. Its better than the Mediatek but due to the bottleneck of the i/o. The memory is really terrible, around 7 - 18mb, compared to normal standard speed of 50+. That last line of the chat looks extremely suspect to me. Doubt any service rep would ever talk like that. Although, these do seem to be reasonable specs to expect. there is no way in hell that it can be under $200. I wouldn't mind if they made the price a bit more, I mean even at £249 it still worth it. Best budget tablet without doubt! I may be wrong but I thought June was the end of Q2 and July started Q3. Or are we talking fiscal? 1.65 espect ratio is really wide. I wonder why they aren't using the standard 1920x1200 1.6 ratio.